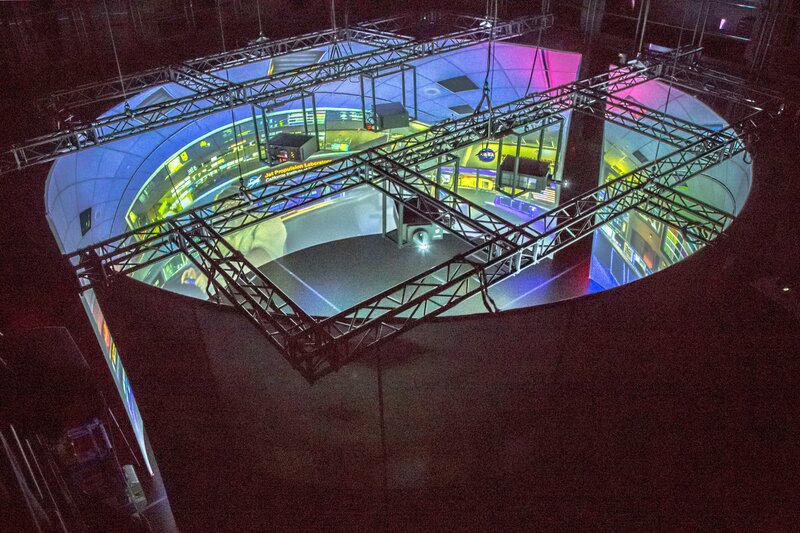 VIDEO BELOW… Virginia Tech’s Institute for Creativity, Arts, and Technology sought our expertise to create a custom immersive projection environment at the Cube, a highly adaptable space for research and experimentation. 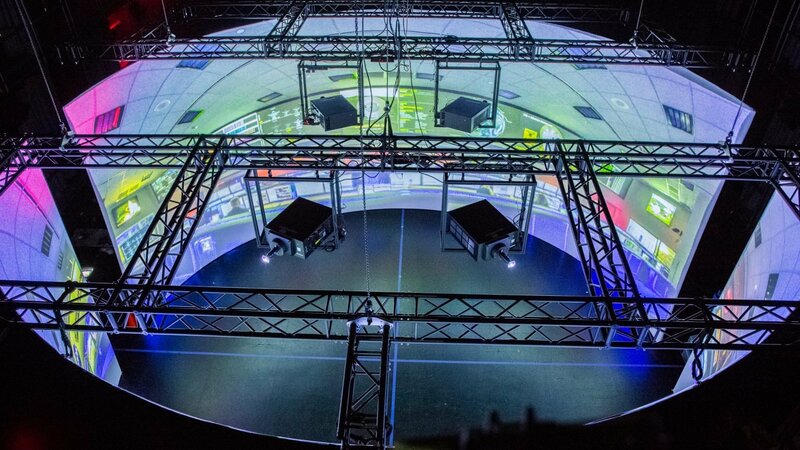 The Elumenati provided a unique design that met the Cube’s requirements, including a motion capture system and an existing 3D spatial audio system. These systems together create a social immersive environment, combining audio and visual technology. VR and AR devices are excellent for conveying immersive experiences on a small scale, but difficult to manage for over a dozen simultaneous users. 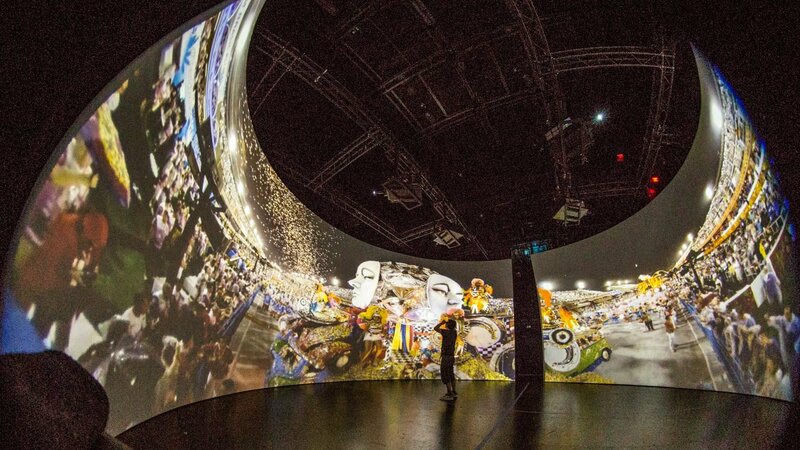 The Cyclorama allows groups of people to experience the immersive visual and sonic environment at the same time. Our custom screen design was guided by two unique requirements: first, it must be acoustically transparent to make use of the spatialized sound capabilities of the Cube; and second, to suit the multi-use space it must be deployable with setup and tear-down within a single day. To provide ingress and egress, we use two identical stretched nylon panoramic screens, each 170°, 32’ in diameter and 16’ high. The screens open toward each other and are separated by an ADA-required doorway width. Projection is accomplished with four edge-blended OmniFocus 30260 systems, each with 1920×1200 resolution at 11,000 lumens, creating 3600×700 resolution per 180 degrees. The client chose to upgrade to laser light engines with 20,000 hours of “lamp” life – effectively zero maintenance for seven years. 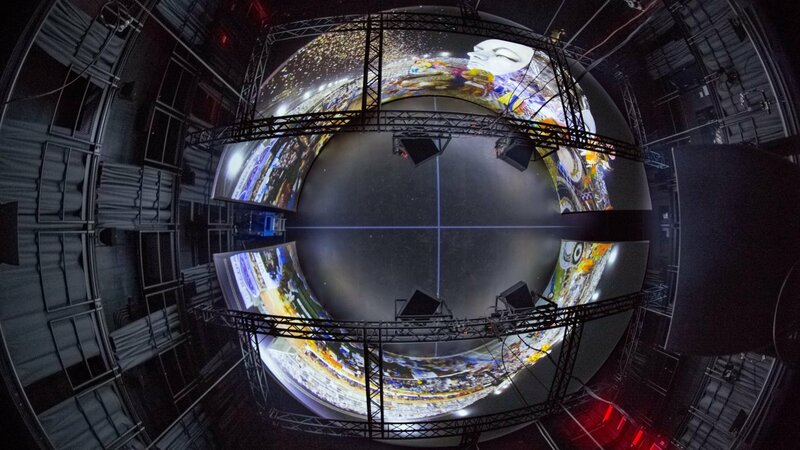 The system debuted a new iteration of WorldViewer for a combined 8K active stereo Cyclorama, supporting both stereoscopic and non-stereoscopic video. This version of WorldViewer incorporates the Spout application launcher, so Virginia Tech staff can drive content from their own VR data visualization platform. The capability to deliver warped and blended, 120Hz stereo movies at 4k resolution per screen from a single Windows-based machine is unique in the industry. We installed a custom rack-mount computer, including camera calibration for automated alignment and blending. Active stereo is managed with shutter glasses and IR emitters. We also provided integration into the client’s show control system using Open Sound Control (OSC). The size of the cyclorama will allow large groups to experience the immersive environment at the same time. The cyclorama will be used to captivate and inform public audiences of all ages with art installations and scientific visualizations. Content will be developed in-house for regional K-12 students. 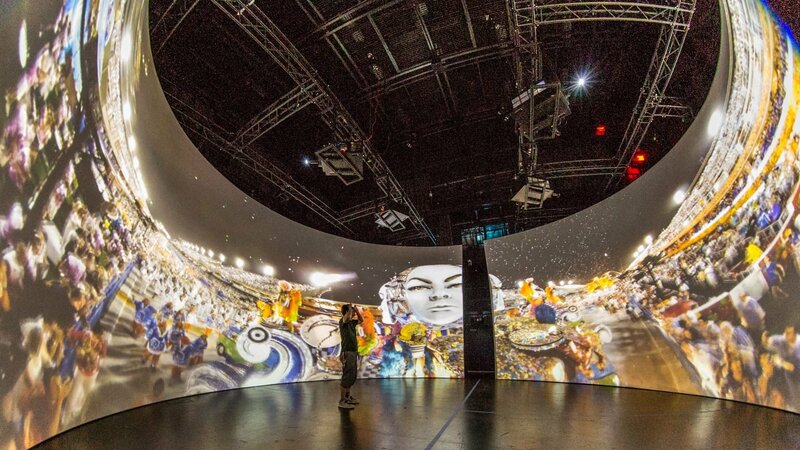 Faculty and students at Virginia Tech are encouraged to submit projects to explore in the cyclorama’s immersive environment for classes and research. This October, the Virginia Tech Science Festival expects thousands of visitors to experience data visualization and sonification of the Belle II particle supercollider in the Cube the Moss Arts Center. Come and celebrate science in the Cyclorama!